Gardening is a wonderful hobby that anyone can enjoy, regardless of if you live in the country, suburbs, or city. Vegetable gardens, herb gardens, house plants – gardens come in all shapes and sizes to fit with anyone’s lifestyle. 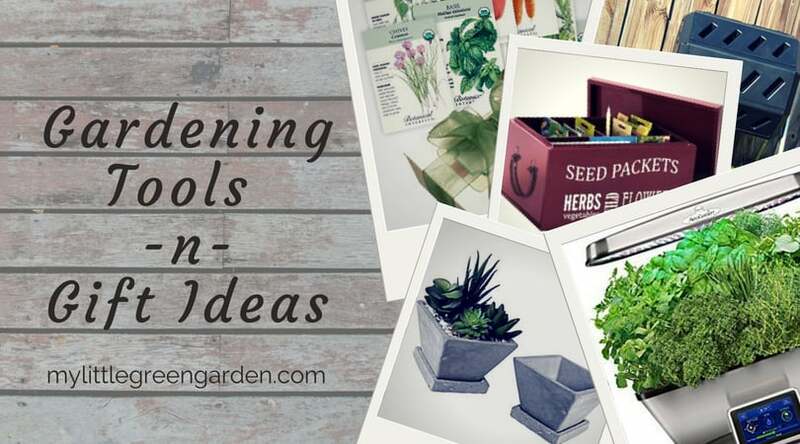 If you enjoy gardening, are interested in starting a garden, or know someone who loves gardening, I’ve created a consolidated list of gardening tools and gift ideas for you! Unlike some gardening gift lists out there, every item listed here I have personally purchased and enjoyed. Take a look around – I hope this list helps inspire you! If you’re interested in composting, but don’t want to create your own compost bin, a compost tumbler is a nice alternative. This is also a great option if you live in a suburban neighborhood with a small backyard. Composting is one of the best ways to feed your garden and keep your garden soil healthy. It’s an organic method that uses basic kitchen scraps that you’d throw away. This is for those of you who are interested in more sustainable lifestyles. To learn more about the basics of composting, check out Composting for a Backyard Garden. Unlike big-box stores like Lowe’s and Home Depot, there are online seed sources with much larger selections of vegetables, herbs, and flowers. My personal Favorite is Botanical Interests. They carry a lot of organic and non-GMO seeds. Botanical Interests has always been reliable for me with great customer service. If you or someone you know loves to garden, this might not be your first garden tool idea. However, if you love plants and DIY projects a utility wagon make come in handy for you. I ended up with one after attending a plant festival where I was purchasing a few plants. Looking back, I don’t know what I was thinking showing up to the plant festival without a way to lug around my plants. It also comes in handy with bringing dirt, compost, and other tools around the house to the backyard. This utility wagon also collapses which is great for storing. I’d say about once a month I have to get down and dirty in my garden to maintain everything – weeding, planting, etc. After a full day of working outside, my back hurts! Bending, squatting, hunching over – it really is a great work out, but sometimes straining. When I got this bench it made such a big difference when working on my raised beds. This bench can also double as a kneeler when you flip it over. 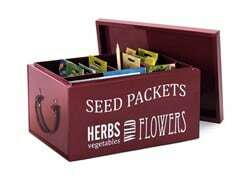 This would make a great gift for anyone who is an avid gardener, and it also collapses for storage. Also known as row covers, Shade Cloths are a great garden item for warmer regions. These can be used to keep your plants cooler during hot summer months. They can also be used to keep pests at bay. I use these every year between April and October to shade my plants. I also use them to protect my squash from pests. Check out this post to learn more: Beat the Heat: Using Shade Cloths in the Garden. These Frost Blankets are a must for anyone who does gardening outdoors in areas where it gets cold (that even includes Florida). Plants can be protected from temperatures that would otherwise be damaged or killed by the freezing temperatures and frost. Frost Blankets can be found in different sizes. This one is the standard size I use on my garden bed (10’x20′). To learn more about keeping your garden protected, check out How to Protect Your Plants from the Cold. Insects aren’t the only pest you can find in your garden – raccoons, armadillos, opossums, squirrels, and birds can become a nuisance as well. A very humane way of dealing with these kinds of pests is using fencing and netting. Physical barriers can especially keep berries and fruit trees safe. Though I’ll admit, many rodents have gone after my vegetables in the past as well. A favorite barrier of mine is plastic poultry netting. It’s easy to cut to size and use as a barrier around your garden. I’ve used it as a fence around my raised garden beds as well as with my fruit tree enclosure. If you live in an area with short growing seasons, or seasons where you can’t grow outdoors (because it’s too cold or too hot), then you might want to consider getting a grow light. Grow lights enable you to grow your seedlings indoors before planting them outdoors. What I like about this grow light is that the light can be raised as your plants grow. Grow lights come in all sizes, but this is the one I use. To learn more about starting your plants indoors, check out How to Start Seeds Indoors. I love starting my plants indoors if I can. You gain so much more control over lighting, watering, and pests. This kit comes with a tray so you protect the surface you keep it on. This package is for 25 plants, but I’ve also gotten them for 50 plants. When you add water to the pellets, they expand over the course of an hour or so. Water first, then plant your seeds. When you go to transplant your seedlings outdoors, you just remove the mesh around the plant. This is way less of a shock for plants than anything else I’ve found. When you’re ready to transplant your seedlings outside, make sure to harden them off. Check out Hardening Off Your Plants for more information. An organic fertilizer, blood meal has been one of those gardening supplements that I use at least once a month in my garden. Blood meal adds nitrogen back into your soil to help your plants become more green and lush. It comes in a black granular form that you add to your soil. Blood meal can also raise the acid level of your soil, which lowers the pH level of your soil. Some plants grow better in soil with lower pH levels. To learn more about blood meal, check out Painting Your Garden Green with Blood Meal for the Garden. An organic fertilizer, Bone meal is a must for me when it comes to any flowering plants. Bone meal is an organic, slow-release fertilizer that can add calcium and phosphorus to your soil. This helps with root growth, flower growth, and blossom-end rot. 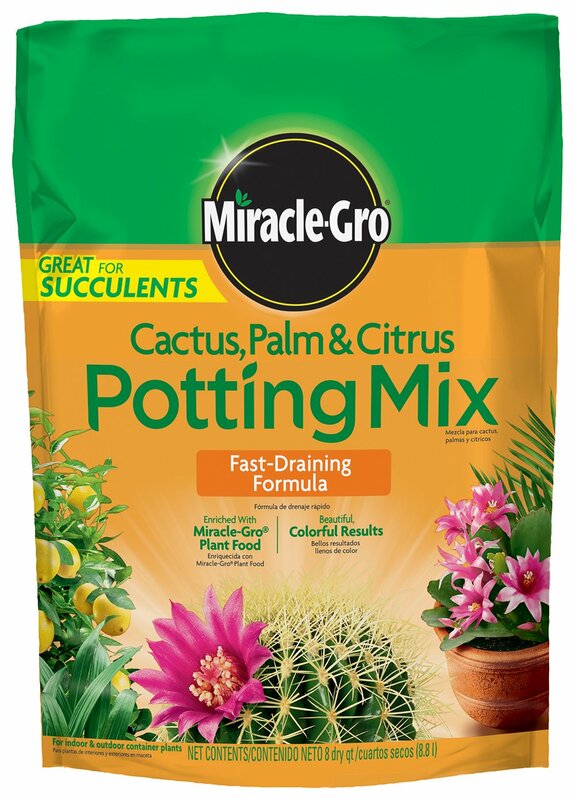 It comes in a powder form that you add to your soil. To learn more about bone meal, check out Prevent Blossom-End Rot with Bone Meal. Checking your soil pH levels is more of an advanced gardening technique. If you’ve been gardening for a little while and want to take your gardening to another level, then I would recommend getting a soil pH meter. A soil pH meter checks to see how acidic or alkaline your soil is. Different plants like different levels. To learn more about testing your soil pH levels and a list of optimal pH levels for different plants, check out Testing Your Soil pH Levels. An organic pesticide, Neem Oil plays such a huge role in my organic garden. If you have an edible garden, this is a great pesticide for you that’s organic. It works as both an insecticide and fungicide that is nontoxic. You can get it in a concentrate or a spray. The one listed here is the concentrate and needs to be diluted with water. To learn the specifics of what it deters, check out Neem Oil for Organic Gardening and Pest Control. This is such a fun gift idea. For anyone who is just getting into gardening, or doesn’t have a backyard, this brings gardening right to your kitchen! I think the best way to start gardening is to grow herbs. This kit is hydroponic, which means there’s no soil – just water and nutrient supplements. Its a greater starter if you’re interested in getting into hydroponics. The light height is adjustable for when your plants grow, and the light is set on a timer. This is a 9 plant kit and it comes with 9 herb pods. AeroGarden has separate Herb Pods or Lettuce Pods you can get for new seasons. They also have Grow Anything Pods where you can add your own seeds to them. This is the stainless steel version which I think looks very nice for the kitchen. The plastic version has been around longer and has a lot more picture reviews for you to look at. They also have a smaller size AeroGarden for 3 plants. Making your own succulent arrangements is so much fun! For the more craftsy gardeners, this makes for a fun project. And you can give your self-made arrangements as gifts! I made the two arrangements in the pictures above and gave them as Christmas gifts. 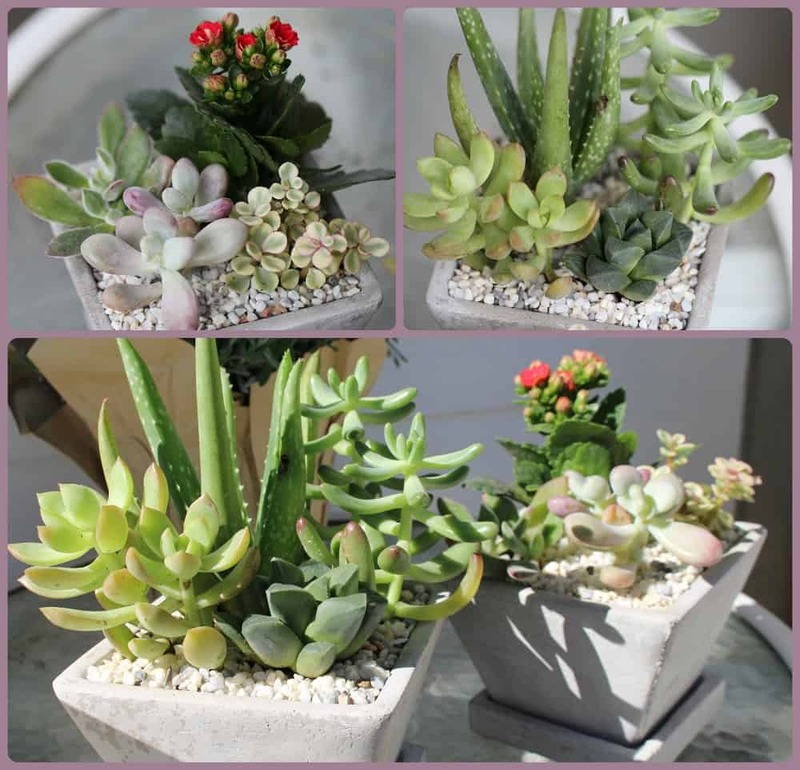 I love concrete and terra cotta pots for succulents, along with cactus potting soil because they help with drainage. These trapezoid planters are unique and cute, and the plates help protect the surface you set them on. I thought the rocks had a very complimentary color for the concrete planters. The plant food helps over time. All you need now are the succulents! Places like Lowe’s and Home Depot carry them, along with succulent nurseries and plant festivals. Planning your garden and keeping track of your experiences can give you such an edge on learning and improving your garden year over year. For anyone interested in gardening, I recommend using a garden planner. Even if you just use a notebook, it makes such a differences when you write things down. It’s easy to think you’ll remember everything, but there’s a lot that happened in the garden that its difficult to keep track if you don’t write things down. This Garden Planner allows you to download it instantly upon purchase. 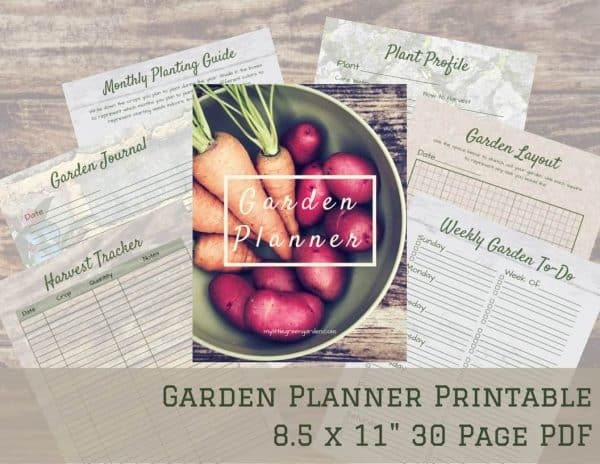 It provides you a 12-month calendar along with pages to design your garden layout, plan out your crops, keep tracking of pests and harvests, make to-do lists and more! There’s also a minimalistic version of the garden planner available. To learn more about the importance of keeping a garden planner, check out How to Plan and Track Your Garden. These plush succulents make great home decor gifts for gardeners. 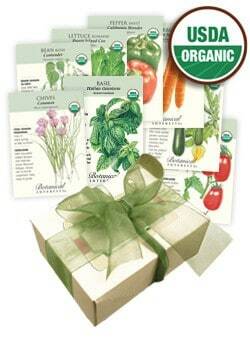 They also make great gifts for those who aspire to garden but haven’t quite started the journey yet. 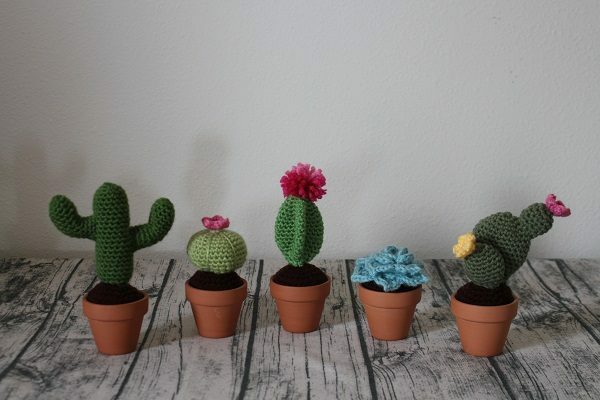 These cute plush succulents require no water, and will survive the toughest of conditions. Hand crocheted with acrylic yarn and stuffed with hypo allergenic polyester filling. 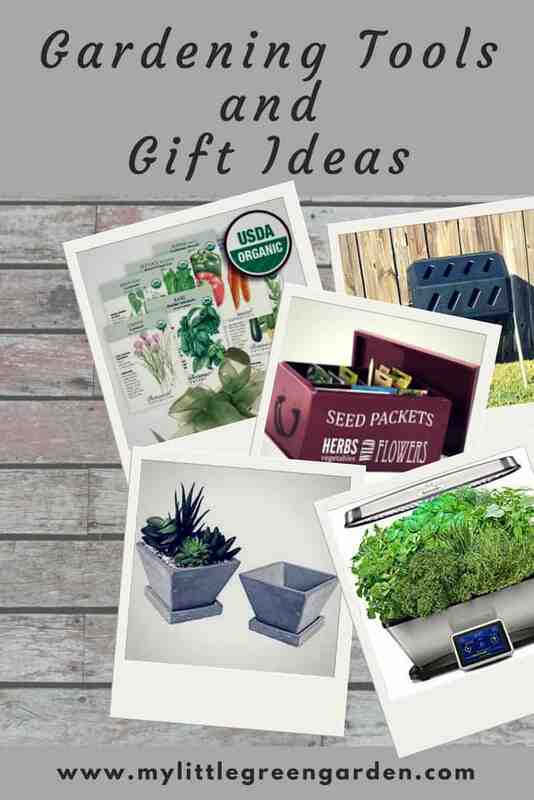 I hope these gardening tools and gift ideas help to inspire you with your own garden, and any gardening gifts you plan to give this year! This is quite a list of great gifts for the serious gardener. I am inspired to get out there and get digging now! Read this at perfect as hubby and i are working on building a garden. Thanks for the tips! !